I joined Bob’s practice four years ago, a year after he started hanging around my yard. In hindquarters sight, those nights chasing the ball were early negotiations for our future partnership. Of course, Bob is the Alpha, which was undisputed even in my own domain. He’s soft-hearted but savvy— that Bob Good. Showed me the ball. Made me sit. Threw it over and over, but always made me bring it back. I was in-between jobs. I didn’t know that humans migrate, but one-by-one my brood left home like gazelles to an open range called college. I admit that my obsessive interest in the ball bordered on depraved. Joblessness is intolerable, especially for a midlife Golden Retriever. I heard that a couple of cats applied for the position in Bob’s office, but when they learned there were no expense accounts, they returned to the lawyer who feeds them. Cats. Where’s the loyalty? Bob wouldn’t hire a cat anyway. For all their political correctness, humans still have their biases. Officially I greet clients. I am a natural polyglot, which was probably a big factor in the hiring decision. I learned human speech easily, once I realized that humans say the same words over and over. I also understand Cat, Good Dog, Bad Dog, and a little bit of Squirrel. Squirrels are not expressive linguistically, so I study their tails. This requires great restraint on my part, and is a slow process. Humans are also called clients. Neither species have tails, which is an unfortunate hardship for them. But I’m not stymied, because human aroma is very telling. I smell grassy shoes, pungent sadness; abrasive colognes, astringent fear. I nuzzle details, poke elbows, gaze imploringly at clients waiting. I sniff and sort clients’ unspoken stories, my inner bird dog joyously tracking gentle hands and smiling eyes. Social taboo and the unfortunate distance between nose and ground prevent humans from acquiring this information as efficiently as I can. And even cat people can’t resist scratching my belly when I display it, a maneuver no one else in the office permits themselves, not even Bob. I love my work. I love how eyes light up when I trot into the room and how so many hands stroke my head. I have my weaknesses, of course. Food on counters. Flashlight beams. That three-legged dog on the White Rabbit. Yet, everyone calls me a good dog, because they can’t resist the good I see in them. Humans need reminders of their goodness, especially when their stories hang like e-collars, begging to be removed. 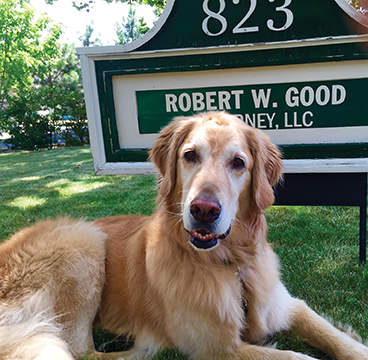 Bring me the bone and I’ll show you the good, a pro-bono service offered exclusively by Rocket, at the Law Office of Robert Good. Robert (Bob) Good has practiced law in Jackson County for 23 years, specializing in family law, estate planning and administration and business law. Contact him at his Ashland office at (541) 482-3763.